The Doctor Who theme was probably playing in your head when you saw this college poster. It was playing in ours, too! This is a unique college poster that can turn your college dorm room into the Tardis. Other Doctor Who Dorm Posters may feature a photo of the whole Tardis. This cool poster for dorm rooms on the other hand is one of a kind and features the sign that is on the Tardis! It even has the blue border of the Tardis around it for extra dorm room decor style. A must have dorm item for Whovians, this Doctor Who - Tardis Sign College Poster will look great on your college closet door, inside of your dorm room on your dorm room door...anywhere in your dorm room, really! The purpose of your dorm room decor and college wall decor is to make your dorm room feel like a home away from home. However, maybe you want dorm essentials in your dorm decor that makes your college dorm room feel a little bit like the Tardis! This college supplies item will help you do that! Those college dorm room walls are going to be a little bland to start out with. 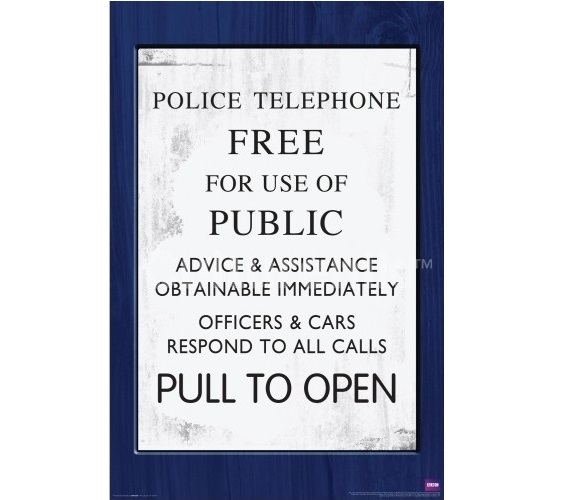 What better way to make them more fun than with our Doctor Who - Tardis Sign Dorm Room Poster. This dorm necessities item will add cool looking college wall decor to your dorm room and display your interests which may give you things to talk about with fellow Whovians that come over to study in your college dorm room.